Guillain-Barre syndrome (GBS) is generally considered to be a post-infectious autoimmune disorder with incompletely clear pathogenesis. However, both infectious and noninfectious factors have been reported to trigger the onset of GBS. We report herein a 31-year-old man who developed acute motor axonal neuropathy after closed head injury hemorrhage in the right frontal lobe and subarachnoid hemorrhage. Whereas he was exempted from any neurological function deficits, intravenous ganglioside was prescribed for treating the head injury. Seven days later, however, tetraplegia and bilateral facial paralysis as well as respiratory failure requiring mechanical ventilation developed. Albumino-cytologic dissociation in the cerebrospinal fluid and electrophysiological findings indicative of axonal impairment supported a diagnosis of acute motor axonal neuropathy. Guillain-Barré syndrome (GBS) is an immune-mediated disorder in the peripheral nervous system with the hallmark of inflammatory infiltration, demyelination and/or axonal damage . Depending on the predominant nature of nerve injury, GBS can be mainly subdivided into acute inflammatory demyelinating polyneuropathy (AIDP) and acute motor axonal neuropathy (AMAN). Usually the development of GSB follows antecedent respiratory or gastrointestinal infections . However, noninfectious events including vaccination, surgery, ganglioside administration could also be a trigger of GBS with the pathogenesis incompletely clarified . Thus far, head trauma has been scarcely reported to be associated with the development of GBS [4,5]. We report herein a 31-year-old male subject who developed AMAN after closed head injury. A 31-year-old man who complained of acute progressive weakness of limbs without antecedent infectious was admitted to the neurological intensive care unit (N-ICU) in the First Hospital of Jilin University. Of note was that seven days before admission, he had a closed head injury caused by fighting which led to intracranial hemorrhage (subarachnoid hemorrhage and hematoma in the right frontal lobe) (Figure 1). He was admitted to the Department of Neurosurgery without any neurological function deficits. Intravenous ganglioside was prescribed for treating his closed head injury during his hospitalization. However, seven days later, tetraplegia and bilateral facial paralysis as well as respiratory failure requiring mechanical ventilation developed. Physical examinations showed paralytic bilateral facial nerves. Symmetric flaccid paralysis in the limbs was noted, with the muscle strength 0 in the upper and lower limbs and tendon reflexes absent (MRC: 0). Investigations including biochemistry and autoimmune screening were all negative. Moreover, blood tests on admission revealed no evidence of multiple organ dysfunction syndrome (MODS), sepsis, or systemic inflammatory response syndrome (SIDS), which is associated with critical illness polyneuropathy (CIP) and/or critical illness myopathy (CIM). A cervical MRI and CT scan ruled out acute cervical myelopathy which could cause tetraplegia. Cerebrospinal fluid (CSF) examination (seventeen days after onset) revealed an increase in protein level (0.67 g/L, normal range: 0.15- 0.45 g/L) with the cell count within the normal range. Electrophysiology revealed that the compound muscle action potential amplitude of the motor nerve of the upper and lower limbs was not elicited suggesting the impairment of the axons. The electrophysiology result met the criteria of axonal GBS, i.e. AMAN. Although the anti-gangliosides antibodies were not detect, the diagnosis of GBS was established and the score of Hughes Functional Grading Scale of the patient was 5 while MRC was 0. Intravenous immunoglobulin (IVIG) (0.4 g/kg/day for five consecutive days) was immediately administered, followed by low dose of glucocorticoids. However, no improvement was observed, and repetitive IVIG was given a month later. He was weaned from mechanical ventilator gradually whereas no other significant improvement (MRC: 0, HFGS: 4) was observed when he was discharged on the 90th day of hospitalization. 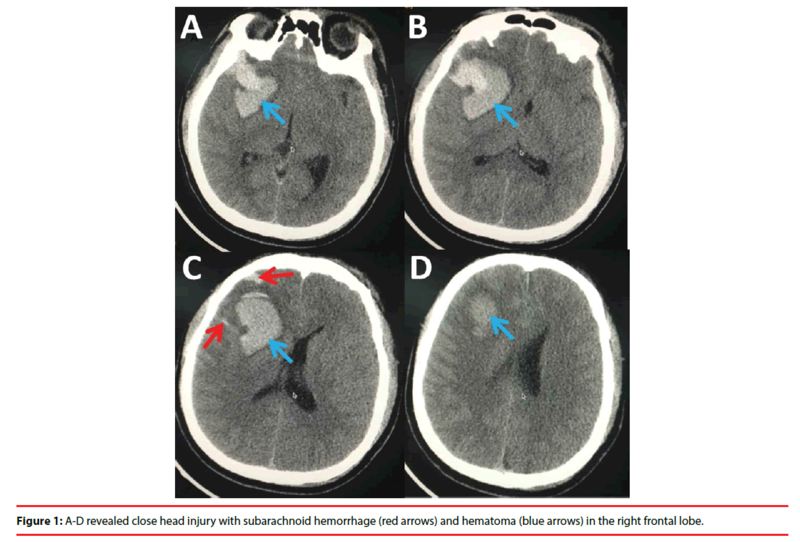 Figure 1: A-D revealed close head injury with subarachnoid hemorrhage (red arrows) and hematoma (blue arrows) in the right frontal lobe. We report a case of AMAN following closed head injury manifesting as tetraplegia, bilateral facial paralysis, areflexia and respiratory failure. Of note was that the patient had been prescribed ganglioside for treating the closed head injury. The diagnosis of AMAN was confirmed by the albumino-cytologic dissociation in the CSF and electrophysiological findings. Both infectious and noninfectious factors are associated with GBS, which may act as triggers of autoimmune responses. The common infectious triggers include bacterial (Campylobacter jejuni, Mycoplasma pneumoniae, etc) and viral infections (cytomegalovirus, Epstein-Barr virus, influenza, etc), which usually result in either the upper respiratory or gastrointestinal infections, whereas pathogenesis is incompletely defined . In addition, although controversial, associations between GBS and noninfectious triggers, including ganglioside administration, vaccination and surgery have been occasionally reported . Yang and colleagues retrospectively analyzed 36 adult patients with GBS and found that surgery, trauma and exogenous ganglioside were common before the onset of GBS. Importantly, the axonal subtype of GBS in post-surgical/ traumatic patients was more common . However, GBS secondary to head trauma only or combined with any other triggers has been scarcely reported [4,5]. In our case, both the closed head injury and the ganglioside administration might contribute to the development of AMAN. The closed head injury, on the one hand, might result in the distribution of blood-nerve barrier (BNB), which is a crucial step for the initiation of autoimmune responses. On the other hand, it may alter the cellular and humoral immunities or activate some hitherto latent or subclinical processes which subsequently induce cellular or humoral changes in human immunity . Ganglioside has been extensively used in various countries because of its neurotrophic role [7,8]. Accumulating cases of GBS after ganglioside treatment led to the suspicion that gangliosides may cause GBS, however, clinical monitoring on the relationship between gangliosides and GBS were controversial [9-11]. Ganglioside might trigger GBS by the “molecular mimicry” pathway or by peripheral nerve endocytosis of the circulating anti-ganglioside antibodies [12,13]. In this patient, exogenous ganglioside serve as an immunogen might act synergistically with the disruption of BNB or alteration of immunity and to trigger autoimmune responses to the peripheral nerves. In sum, head trauma and intravenous use of ganglioside may act synergistically to trigger the autoimmune attack of AMAN. Nevertheless, more controlled studies and animal experiments are still needed before a robust conclusion can be reached. Zhang HL, Zheng XY, Zhu J. Th1/Th2/Th17/Treg cytokines in Guillain-Barré syndrome and experimental autoimmune neuritis. Cytokine. Growth. Factor. Rev 24(5), 443-453 (2013). Van Doorn PA, Ruts L, Jacobs BC. Clinical features, pathogenesis, and treatment of Guillain-Barré syndrome. Lancet. Neurol 7(10), 939-950 (2008). Wakerley BR, Yuki N. Infectious and noninfectious triggers in Guillain-Barré syndrome. Expert. Rev. Clin. Immunol 9(7), 627-639 (2013). Tan IL, Ng T, Vucic S. Sever Guillain-Barré syndrome following head trauma. J. Clin. Neurosci 17(11), 1452-1454 (2010). Zhang GZ, Li XG. Cerebral trauma, Campylobacter Jejuni infection, and monosialotetrahexosylganglioside sodium mediated Guillain-Barré Syndrome in a Chinese patient: a rare case event. J. Neuropsychiatry. Clin. Neurosci 26(2), E16-E17 (2014). Yang B, Lian Y, Liu Y, et al. A retrospective analysis of possible triggers of Guillain-Barre syndrome. J. Neuroimmunol 293(1), 17-21 (2016). Garattini S, Garattini L. Pharmaceutical prescriptions in four European countries. Lancet 342(8881), 1191-1192 (1993). Lim ST, Esfahani K, Avdoshina V, et al. Exogenous gangliosides increase the release of brain-derived neurotrophic factor. Neuropharmacology 60 (7-8), 1160-1167 (2011). Govoni V, Granieri E, Casetta I, et al. The incidence of Guillain-Barre syndrome in Ferrara, Italy: is the disease really increasing? J. Neurol. Sci 137(1), 62-68 (1996). Govoni V, Granieri E, Tola MR, et al. Exogenous gangliosides and Guillain-Barré syndrome. An observational study in the local health district of Ferrara, Italy. Brain 120(7), 1123-1130 (1997). Govoni V, Granieri E, Manconi M, et al. Is there a decrease in Guillain-Barré syndrome incidence after bovine ganglioside withdrawal in Italy? A population-based study in the Local Health District of Ferrara, Italy. J. Neurol. Sci 216(1), 99-103 (2003). Wu X, Wu W, Wang Z, et al. More severe manifestations and poorer short-term prognosis of ganglioside-associated Guillain-Barré syndrome in Northeast China. PLoS. One 9(8), e104074 (2014). Cunningham ME, McGonigal R, Meehan GR, et al. Anti-ganglioside antibodies are removed from circulation in mice by neuronal endocytosis. Brain 139(6), 1657-1665 (2016).